A week ago I participated in the Global Legal Hackathon as a mentor to several startups. The Global Legal Hackathon engages law schools, law firms and in-house departments, legal technology companies, governments, and service providers to the legal industry – across the globe. It bring together the best thinkers, doers and practitioners in law in support of a unified vision: rapid development of solutions to improve the legal industry, world-wide. My city, Belo Horizonte was one of the hosts in Brazil. Two startups i mentored, to use IBM Watson, was classified in second an third place. Next week will be the second round to select ideas to the final event in New York. I received an e-mail from HCL Support (IBM) about a problem with the interin fix. The e-mail and later a call from the support told me to download the fix again and if in case i was installed the fix how to remove and install the good one. The problem was with the fix files from last week. The files was updated with the ones above. 4 – Install the new interin fix. I start a new java project on eclipse using the SDK for Watson. This error means, that the local Liberty trust store does not have the correct signer certificate from the remote WATSON website where you tries to connect to. I use many vm’s in my day to day on my Mac. When I’m on clients and I have to use different networks of my other, always have to be changing the ip’s of virtual servers and this is a big problem. A friend sent me the following tip : Place a secondary ip in your MAC that belongs to the same network of VM’s. I don’t find a easy way to put a secondary ip on my wifi connection. The only way i found was duplicating the wifi network and set up fixed ip in the same network of virtual machines . This will be the new name of WebSphere? Security: Quad9 blocks against known malicious domains, preventing your computers and IoT devices from connecting malware or phishing sites. Whenever a Quad9 user clicks on a website link or types in an address into a web browser, Quad9 will check the site against the IBM X-Force threat intelligence database of over 40 billion analyzed web pages and images. Quad9 also taps feeds from 18 additional threat intelligence partners to block a large portion of the threats that present risk to end users and businesses alike. Performance: Quad9 systems are distributed worldwide in more than 70 locations at launch, with more than 160 locations in total on schedule for 2018. These servers are located primarily at Internet Exchange points, meaning that the distance and time required to get answers is lower than almost any other solution. These systems are distributed worldwide, not just in high-population areas, meaning users in less well-served areas can see significant improvements in speed on DNS lookups. The systems are “anycast” meaning that queries will automatically be routed to the closest operational system. An archive of all O’Reilly data ebooks is available below for free download. Dive deep into the latest in data science and big data, compiled by O’Reilly editors, authors, and Strata speakers. 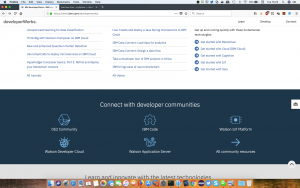 will use the new IBM Support Community support portal. The interface is clean and you can search for fixes, open Cases (not PMR’s anymore) and talk with Watson on a chat screen. Watson™ Explorer Natural Language Querying (NLQ) improves the user search experience by allowing the user to query Watson Explorer using natural language queries such as questions. This is accomplished through the use of two components: Query Modifier, which modifies user queries before they are executed, and Ontolection Trainer, which provides machine learning tools that can generate ontolections for use in query expansion. The setup process is not hard you can follow the instructions here. On WEX applications (using projects) the process is a little different and not well documented. The Knowledge center only tell you about the macro and not were to put the macro. impacted by unplanned downtime, there is a short period of time during which no database instance is running. Oracle RAC system, because multiple instances are already running concurrently, accessing the same database. Until last week everithing was fine until the Oracle node fails and switch to the second instance. The switch took more than 20 minutes and the entire WebSphere Portal hung. We must restart all cluster nodes on WPS. The 20 minutes time was not spected for the Oracle team and they found a bug and apply a fix provided by Oracle. The “normal” time = 3 minutes. This is more than the WPS can support. Portal works well until a failure. “To your question regarding recovery of Portal if the database is available again: If the database is available again, Portal would connect to the database. However, Portal makes heavy use of caching. If the database is not available for a longer time, it can be that during error handling of requests coming in during this time, some Portal caches come into a state where recovery is difficult or even impossible after the database is available again. And finally IBM told that this is an unsupported setup. Conclusion: Oracle RAC is for HA and supported by IBM. Oracle RAC One Node is for FAIL OVER and is not supported by IBM. A good DNS service is very important for a mail server. for this option is silently capped to 30. Using the configuration above, both nameserver in rotation and wait max. 1 second for answer before trying the next one. On a customer site, all windows machines has a GPO to turn on the IE compatibility mode. The new WebSphere Portal does not work well with this compatibility mode. The header above tell the IE browser to not use compatibillity mode when accessing the new portal.